This was the first design if you don't count the default index.html that came with the webserver. Of course I had to run my own server. The webserver was run on my Sun workstation. At first it was a SPARCstation 2, later on I've used a SPARCstation 5. 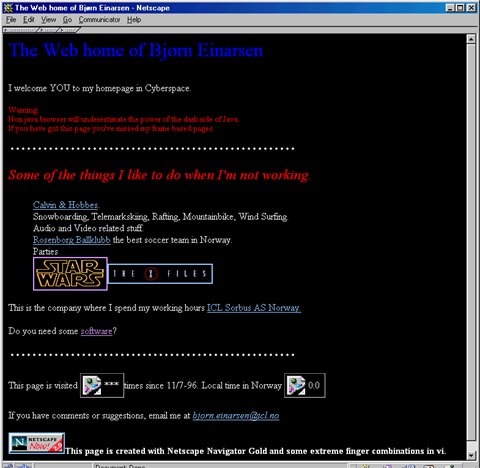 The first software I used was a NCSA httpd daemon (I think) after that I used a Netscape server for a while. I think this was made available on the Internet around 1993-94, but I'm not quite sure when. Not very impressive design, but at the time I thougt it was okay. I don't have the counter and time programs running anymore so the graphics file was not found when I made this snapshot.